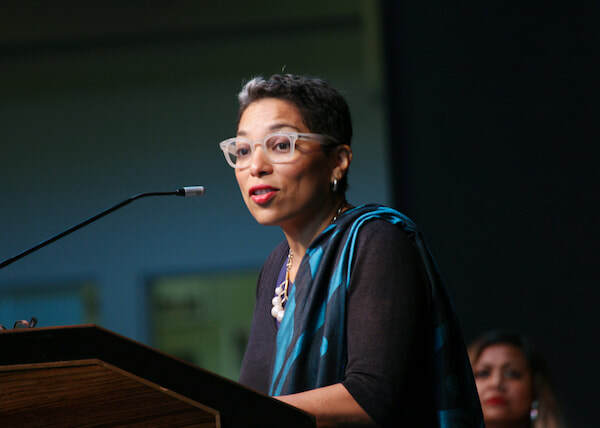 ​Named the 2018-2020 Washington State Poet Laureate, Claudia Castro Luna was born in El Salvador and is the first immigrant and person of color to assume the role. She recently ended her tenure as the first Seattle Civic Poet (2015-2017), a program administered by the city’s Office of Arts & Culture. She is the author of Killing Marías (Two Sylvias Press 2017) and This City (Floating Bridge Press 2016). PRISCILLA CELINA SUAREZ: Claudia, first of all, congratulations on being selected as Washington State’s Poet Laureate. And thank you for being on Latino Book Review. CLAUDIA CASTRO LUNA: Thank you for the opportunity to share my story with your readership. SUAREZ: You recently finished your tenure as the inaugural Seattle Civic Poet. Congratulations on that, by the way! How did you engage with your community during this venture? Do you feel this opportunity has impacted how you perceive and document your stories through poetry? CASTRO LUNA: During my Civic Poet tenure I engaged with Seattle residents in a variety of ways. Through the Public library system and in various corners of the city I taught a series of drop-in poetry writing workshops. I called the program, The Poet Is In, and the aim was to get a broad swath of residents writing poems of place. I am interested in urban landscapes and geared these classes around themes in which everyone could find common ground: What memories do we carry about the place we inhabit? How do we wish it were different? What specific landmarks, or people make neighborhoods feel like home? I wanted all participants to feel the power behind their personal stories. These questions provided immediate emotional access to everyone who participated; we all have stories to tell about the place we live in. This allowed the participants easy access to their feelings and expressing feelings is the core of poems. This program was very successful and many of the poems appeared in a digital poetic map, which was my culminating project as Civic Poet. In addition to the workshops I visited in schools throughout the city, taught poetry in Spanish to eighth graders at an international middle school, attended a plethora of readings, and worked whenever possible to step outside literary circles to collaborate with community based agencies providing housing services, domestic violence support, immigration resources among others. SUAREZ: The Seattle Poetic Grid (www.seattlepoeticgrid.com) was a successful project you put together as the Civic Poet. The response from your community was incredible! If I were to bribe you with pan dulce, would you share some of the upcoming projects you are preparing as your State’s Poet Laureate? CASTRO LUNA: Yes! It was a huge success. What I love most about that project is that I incorporated the poems of place written by folks who turned up to my drop-in writing workshops at the public libraries. For the map to be successful it needed to have broad citizen representation. There are poems on the poetic grid written by folks who had never previously written a poem and by those who have several poetry books under their belts. Poems written by school children and high school students share space with poems written by seniors both in Spanish and English. And of course there are poems in languages other than English: in Spanish, Arabic and Japanese. Building on the success of the Seattle Poetic Grid I hope, as Washington State Poet Laureate, to construct a similar map on a state-wide scale. Washington State has a rich and varied geography from high desert landscapes, to spectacular mountain ranges, agriculturally rich prairies and the Puget Sound area with its thriving island communities. I want to create a document that permits folks in one corner of the State to imagine life in the opposite corner: from Sound to prairie, from lush mountains to desert areas. I want to encourage poems that tell of the places we inhabit, and through that exercise I hope to surface the things that bring us closer together, that ground us a Washington residents. SUAREZ: You were born and raised in El Salvador, and came to the United States during your youth. What was that transition like for you? Do you ever discover these experiences popping up in your art? CASTRO LUNA: I came to the US at the age of 14. Of English I knew little. I knew the word “tree” and how to say, “good morning.” It was a difficult time for my family, but we felt extremely fortunate to have escaped the Civil War in El Salvador, and we were cognizant that our leaving together as a family unit was also a rarity. That knowledge helped us endure the struggles we faced. We arrived in Florida, moved to New Jersey and finally settled in California. By the time I graduated from high school I received my graduating class award for English, not because I had achieved great mastery of the language, but because I had tenacity for learning. I was a diligent student and volunteered to work in the school’s literary magazine and newspaper. If it had to do with words, I said “Presente!” The school faculty must have noticed that. The award remains one of my most meaningful accomplishments. ​By necessity these experiences show up in my work. I have tried to capture my immigrant experience in my prose – this is because I have found the need to provide historical context in telling my story of displacement and immigration. But more and more I board these themes in poems as well. SUAREZ: As the first immigrant selected to be Washington State Poet Laureate, your voice will be a representation of immigrant communities throughout the nation. What are some of the messages you would like for other immigrants to hear through your poetry? CASTRO LUNA: I came to poetry late in my life. I was the mother of two girls when I gave up my job and entered an MFA program. But I could have done it much earlier, since poetry was for years and years showing up in my life asking me to write it, to take it seriously. What I lacked was role models – There are women poets of course but in lesser numbers than men. When I was at university, I never came across any poetas or poetisas writing in the US who looked like me, who had similar life circumstances as mine. Role models are key for young people to imagine themselves in a plethora of possibilities. I hope that my tenure as WA Poet Laureate contributes to the growing number of role models we have in the Latino community. My dream is that a young girl may see me, or hear me read a poem and say, “I can do that!” or “I want to do that” and of course they can. I also want to contribute dismantling the noxious images and stereotypes of immigrants from Central America. Salvadoran came here in large numbers because of the US funded civil war in our country. Those arriving these days are still escaping the economic and social disintegration of our society due to the war years. We are, as all immigrants have been before us, and as the general population is, a varied group of people. Above all we are seeking peace and justice, economic justice, social justice, and we have all sorts of abilities and desires to contribute our best to our new society. Immigrants are not monolithic in their needs and expression of selfhood, we are varied, we are vulnerable, we are brave and some of us are poets. Finally, I hope as WA Poet Laureate to engage the notion of arrival. Our state is a young state; we have only 130 years of statehood history! There are trees in our territory older than that. Everyone here, except for native peoples, has a story of arrival, stories of grit and determination, of hopes and dreams. I want to surface those stories to evidence how much we have in common: those of us who arrived a year ago and those who may have been born in this state, but who can point to a relative or relatives who arrived here not so long ago, from a far away place, seeking a better life. SUAREZ: With Spanish being your mother tongue, how do you engage with language in your poetry? CASTRO LUNA: That is an excellent question. I write in English or in Spanish – seldom in both at the same time. The main reason for that is that I command much broader, deeper language reserves in English. As time goes by however, I am using more and more Spanish in my poems. Sometimes words appear here and there; sometimes I insert entire phrases into a poem. I have become less concerned with the issue of translating. If the poem opened up the necessity for Spanish to come in then I let it be. I leave it as is. The reader then has a choice to make: to seek translation, to translate themselves if they are able, or to engage with the representation on the page. The poem still carries on with its impulse, but is able to offer different locations for understanding. SUAREZ: You recently had a book of poetry, Killing Marias: A Poem for Multiple Voices, released by Two Sylvias Press. Tell us more about this collection. CASTRO LUNA: This is a book seven years in the making and remembers femicide victims, women and girls, of Ciudad Juárez, Mexico. There are 45 poems in the collection, 43 of them written to each victim I found in my research whose name began with María. The poem weaves the Catholic prayer, Litanies to the Virgin, and the imagined women’s voices, hopes and desires. As the words loop, they weave flesh and spirit creating a shared cosmology, a covenant of love and a place of survival and allegiance. Thematically the book begins in Juárez, but it turns to explore issues of domestic violence and the ways in which our consumer choices fuel the extortion and exploitation of women here and abroad. It is my dream to travel to El Paso and to Juárez one day and read from the book there. SUAREZ: What is currently on your reading list? Are there any anthologies by other poets you’d recommend to us? CASTRO LUNA: At the moment I am re-reading Italo Calvino’s imaginary cities. I love this book. All the liminal spaces it occupies: the real and the imaginary, the prose poem and fiction, what is memory and what is real, Is the singular also plural, language and dream. I recently wrote an article for Poetry Northwest on the poet Gregory Orr https://www.poetrynw.org/ocean-inside-us/. I enjoyed reading River inside the River and the book of essays Poetry as Survival, on the ways in which the structure of poetry provides refuge and solace for people who have endured traumatic experiences. I like the sparseness of Orr’s poetry, the way in which he assembles sequences of short lyric poems to great emotional effect and linguistic discovery. Yesterday I finished a novel, Rachel Cusk’s Outline. This is a novel where nothing much happens in terms of plot, its tour de force lies in the questions it asks the reader to consider. When it comes to anthologies I go back and back again to a collection edited by Cecilia Vicuña, ÜL: Four Mapuche Poets, published by Latin American Literary Review Press. It is a bilingual edition – Mapuche alongside Spanish. The Mapuches are the ancestral people of Chile and Western Argentina. Vicuña has done an extraordinary job showcasing four contemporary poets, three men and a woman. Each of the poets speaks with such clarity and conviction whenever I read them everything around me becomes still like heart’s night, or a mountain landscape where only the wind speaks. SUAREZ: Claudia, it’s been a pleasure chatting with you. Thank you for taking the time to connect with us on Latino Book Review. As we come to the end of this interview, will you share a poem with us?